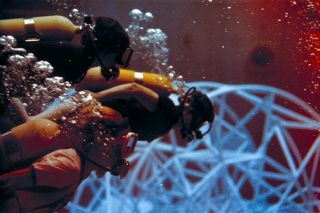 Women scientists train in the Neutral Buoyancy Simulator in 1975. In this historical photo from the U.S. space agency, women scientists in training at Marshall Space Flight Center, (top to bottom) Carolyn Griner, Ann Whitaker, and Dr. Mary Johnston, are shown simulating weightlessness while undergoing training in the Neutral Buoyancy Simulator. These women were part of a special program dedicated to gaining a better understanding of problems involved in performing experiments in space. The three were engaged in designing and developing experiments for space, such as materials processing for Spacelabs. Dr. Johnston specialized in metallurgical Engineering, Dr. Whitaker in lubrication and surface physics, and Dr. Griner in material science. Dr. Griner went on to become Acting Center Director at Marshall Space Flight Center from January to September 1998. She was the first woman to serve.